Deputy CM Mr. Sukbir Singh Badaltoday flagged off the first train to Varanasi from Jalandhar City railway Station under the MukhMantriTirathYatra Scheme. Another train to Varanasi will start from Ludhiana. Besides this, 11 more TirthYatra trains are planned to start in January and February under this scheme. 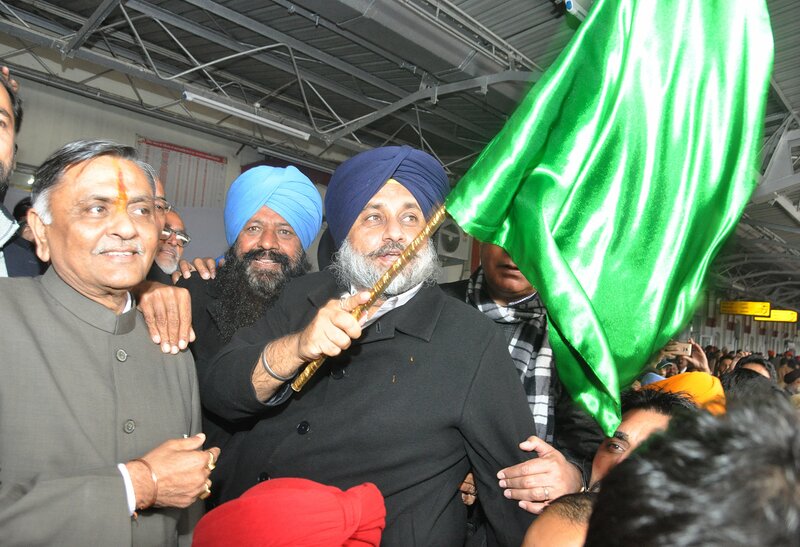 He also interacted with the pilgrims in the train, who thanked the Punjab Government for this noble scheme. Answering a question about the Panama incident, Mr. Badal said the Punjab government had raised the issue and had been assured by the Union External affairs ministry that all possible steps would be taken on the issue. He also directed the Police department to immediately start the crackdown on illegal travel agents. He also appealed to the media houses not to publish the advertisements of illegal travel agents to safe the interests of common man. Talking about development initiatives by the Punjab Government, Mr. Badal said that Punjab is the first power surplus state across the nation besides having unmatched road and air connectivity. Prominent amongst present on the occasion included Cabinet Minister Ajit Singh Kohar, Sohan Singh Thandal, BhagatChunniLal, CPS Pawan Kumar Tinu and K.D. Bhandari, MLA ManoranjanKalia, District Planning committee chairman GurcharanSingh , Chairman DilbahHussain, Principal secretary Transport Department, R. Vekatratnam, Deputy Commissioner K.K.Yadav, IG ArpitShukla, DIG S.K.Verma, Police Commissioner Jalandhar Yurinder Singh Hair. The attainment of heritage city status for the holy city of Amritsar. An amount of Rs. 69 crores has been allocated to preserve the monuments, mute testimonials of Punjab’s glorious heritage. Facelift of Sri Harminder Sahib’s façade at an outlay of Rs. 211 crore. The second phase for the same is underway. Preservation of DarshaniDeori (opening step), at Darbar Sahib with its original and extensive ivory work has been accomplished. Preservation of architectural marvel of BungaRamgarhia (situated between Sri Guru Ram Das langar hall building and Sri Harmandir Sahib parikarma) as a heritage building with the support of Heritage Management Services, Noida. To present the 500-year old glorious legacy to the millenials of Punjab, the Punjab government has built Virasat-e-Khalsa at Sri Anandpur Sahib. The project spread in 100 acres has costed Rs.250 crores. The SAD-BJP government has built a Victory Memorial in the memory of Banda Bahadur at Chapparchiri near SAS Nagar at a cost of Rs 6.2 crore. A 328 feet high burj has been built as a memorial of 1711 misls. To commemorate the sacrifices of Sikhs in the tragic war of May 17, 1746, a memorial has been built at the ChhotaGhallughara site at Kahnuwan in Gurdaspur district at an outlay of Rs. 18 crores. Punjab Government has also built WaddaGhallughara site in village KupRohira in Sangrur district at a cost of Rs.24.70 crore, in the honour of martyrs of 1762 genocide. Punjab Government has allocated Rs 180 crores for Ram Tirath, the sacred ashram of BhagwanValmikiJi. The construction of Jang-e-Azadi Memorial, in the commemoration of the martyrs of the freedom struggle, is underway at Amritsar. The Punjab government has announced the construction of Sri Guru Ravidas Memorial at Kuralgarh on the expanse of 13 acres with an investment of Rs. 50-60 crores. The Punjab government had approved Rs 24 crores for Baba Jiwan Singh Memorial to be erected at Sri Anandpur Sahib near Virasat-e-Khalsa. Badal government has taken an initiative to build BhaiMardana Memorial at Ferozepur. Project cost is estimated to be Rs 11 crores. The Memorial will also house a Sangeet Academy and a Satsang hall. Sri Guru Granth Sahib World University spread over 100 acres has come up at Fatehgarh Sahib. Jointly conceived by ShiromaniGurdwaraParbandhak Committee and Punjab Government, this university provides teachings of Sikh religion besides other religions. Punjab Government under the tutelage of CM Mr. Prakash Singh Badal has always ensured communal harmony in the state while ensuring respect for all religions in the state.